"The Fourfold Gospel is the Christological summary on which the core values of the Christian and Missionary Alliance is based." When we repent of our sin and by faith believe in the death and resurrection of Jesus Christ our sins are forgiven and we justified, that is declared righteous in God's sight our sins no long being held against us because Jesus bore our sin and paid the penalty of our sin in His death on the cross. "Is anyone among you sick? Let him call for the elders of the church, and let them pray over him anointing him with oil in the name of the Lord. And the prayer of faith will save the one who is sick, and the Lord will raise him up." (James 5:14,15 ESV) We will look at this in detail later in the message. And lastly, The Crown - Jesus Christ is our Coming King. Jesus is the King of Kings. He has no rivals. The Bible declares that Jesus Christ died, was buried and three days later rose from the dead. And just as the Scriptures give witness to the literal bodily resurrection of Jesus Christ from the grave, the Bible is equally emphatic in its declaration that one day Jesus Christ will physically return to this earth. "For the Lord himself will come down from heaven, with a loud command, with the voice of the archangel, and with the trumpet call of God, and the dead in Christ will rise first. After that, we who are still alive and are left, will be caught up together with them in the clouds to meet the Lord in the air. And so we will be with the Lord forever." (1 Thessalonians 4:16-17 NIV) That is the promise for every believer! The Fourfold Gospel, the Christological summary; Jesus is our Savior, Sanctifier, Healer and Coming King. Let me pause here and ask you a question. Is Jesus Christ your Savior? Have you received the forgiveness and the gift of eternal life He alone can offer you? It is ours when we repent of our sins and put our faith in His death and resurrection as God's only provision for our salvation. Knowing Jesus as your Savior is the starting point of knowing him as your Sanctifier, your Healer and your coming King. This morning I want to focus on two aspects of healing as found in the Scriptures and noted in this doctrinal statement. First of all, what is the Biblical truth that substantiates that Christ is our healer? 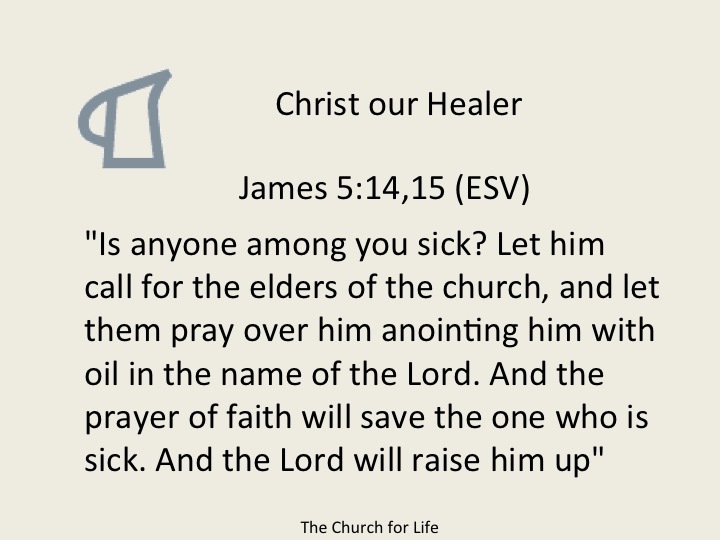 Secondly, the ministry of healing in the local church as outlined by James in the fifth chapter of his letter. "The claim for healing in the atonement rests on two principal passages of Scripture: Isaiah 53:4-5 and Matthew 8:17." (Dr. Keith Bailey, The Children's Bread, page 43) He states that atonement is "...the procuring cause of healing." To "procure" means to obtain something to acquire or secure it. As we have noted in the Alliance Statement of Faith, "Provision is made in the redemptive work of the Lord Jesus Christ for the healing of the mortal body." What is the relationship between divine healing and Jesus Christ's work of atonement on the cross? There is a reason I began this morning by reviewing the Fourfold Gospel. You see, God's provision for the healing of the believer is not unrelated to Christ's redemptive work of atonement on the cross for the forgiveness of our sin and His work of sanctification in our lives. Both our salvation and God's provision for the physical healing of our bodies, come from the substitutionary death of Jesus Christ on the cross. As Dr. Bailey noted, the key text in this regard is found first in the Old Testament and the fulfillment of it, in Matthew's account of the healing ministry of Jesus while in Capernaum as recorded in Matthew chapter 8. Let me read Matthew 8:17. in it's context beginning at verse 14. Matthew says that the healing ministry of Jesus Christ was in fulfillment of the words of the prophet Isaiah written centuries before, as recorded in Isaiah 53:4. We cannot and should not underestimate the significance of this text with regard to the ministry of Christ our Healer. Let me read you Isaiah 53:4 (ESV) in its larger context beginning with verse one down to verse six. Remember that in this passage Isaiah is speaking prophetically of Israel's coming Messiah often referred to as the "Suffering Servant". Note how he suffered for you and I. "Who has believed what he has heard from us? And to whom has the arm of the Lord been revealed? For he grew up before him like a young plant, and like a root out of dry ground; he had no form or majesty that we should look at him, and no beauty that we should desire him. He was despised and rejected by men, a man of sorrows, and acquainted with grief, and as one from whom men hide their faces he was despised and we esteemed him not." "Surely he has borne our griefs," (Matthew - illnesses) "and carried our sorrows;"(Matthew - diseases) "yet we esteemed him stricken, smitten by God and afflicted. But he was wounded for our transgressions; he was crushed for our iniquities; upon him was the chastisement that brought us peace, and with his stripes we are healed. All we like sheep have gone astray; we have turned--everyone -- to his own way; and the Lord has laid on him the iniquity of us all." "he was smitten by God and afflicted"
"he was crushed for our iniquities"
"upon him was the chastisement that brought us peace"
Do you see God's love for us in these verses? His grace? His unmerited favor? Jesus Christ, the Creator of this world, the sustainer of all life, the sovereign, powerful, omnipotent ruler of the universe, allowed Himself to be despised and rejected; to be "smitten by God and afflicted"; to be "wounded for our transgressions"; to be "crushed for our inequities" so that He could make atonement for our sin and heal our sicknesses. Most versions of the Bible translate Isaiah 53:4, "he has borne our griefs and carried our sorrows" as it might be in the version you are reading. Similarly, most versions of the Bible translate the next phrase of Isaiah 53:4, "and carried our sorrows." This word can also be translated "pains". Matthew used the word "diseases". The English Standard Version, "and bore our diseases", or New American Standard Bible, "carried away our diseases". The Messiah "carried our sorrows" or our "pains" or diseases. Secondly, this morning, a look the ministry of healing in the local church as outlined by James in the fifth chapter of his letter. From the moment Adam and Eve fell into sin sickness and death became a part of the human experience. Sin not only separated man spiritually from God but sin brought sickness, disease, pain and death to the human experience. But one cannot read either the Old or New Testament without taking notice that God heals the sick. Accounts of divine healing are found as early as the book of Genesis. We do not have time this morning to review some of those accounts. But as we have noted in the Alliance Statement of Faith, "Prayer for the sick and anointing with oil are taught in the Scriptures and are privileges for the Church in this present age. (Matthew 8:16-17, James 5:13-16)"
The instructions found in James 5 have never been revoked or repealed. They are as valid to day as they were in the day James wrote them, giving us instructions in implementing a ministry of healing in the life of the local church. First of all, note the prominence of prayer in James instructions. One cannot read this passage without taking note of the role of prayer in the ministry of healing. It is mentioned five times in the four verse we just read, seven times if your read through verse 18. Notice the five references: verse 13 - James instructs those who are suffering to pray. Verse 14 - Those who are sick are to "call for the elders of the church" to pray over them. Verse 15 - It is "the prayer of faith" that will heal the sick. Verse 16, The congregation is to pray. "Therefore, confess your sins to one another and pray for one another, that you may be healed." And again verse 16, It is the "prayer of a righteous person" that "has great power". Prayer is a "spiritual exercise" as Dr. Keith Bailey has pointed out. (Bailey, ibid. page 133) And prayer is the atmosphere, the context, the setting in which the church is to experience healing. Secondly notice the ministry of the elders of the church. The sick are instructed to call for the elders to pray for them and anoint them with oil. That constitutes an act of obedience on the part of the individual who is sick. The elders are the men who God has entrusted with the oversight and spiritual care of the church. Fourthly, verse 15, notice it is the "prayer of faith" that "will save the one who is sick, and the Lord will raise him up." Our faith is only as effective as the object in which we place our faith. That's why we have attempted in the first part of this message to present the Biblical truth that substantiates that Christ died on the cross to atone for our sicknesses as well as our sins and therefore is our healer today! 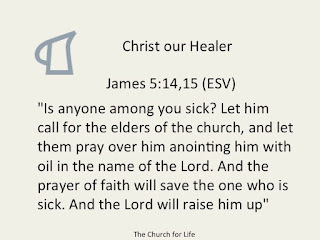 When everyone in the church --- the elders, the sick being prayed for, and rest of the church pray for healing it is to be a prayer of faith in the promises and provision of God for the healing of the sick. Just, as it is a prayer of obedience to these instructions James has given to the church.
" And the prayer of faith will save the one win who is sick, and the Lord will raise him up. And if he has committed sins, he will be forgiven. Therefore, confess your sins to one another and pray for one another, that you may be healed." I hope that you have seen this morning that one cannot separate the healing available to us in the gospel, from our personal relationship with Jesus Christ. Just as Christ is our Savior by faith and the work of regeneration by the Holy Spirit; just as Christ is our Sanctifier by our surrender to and the filling of His Holy Spirit; so He is our Healer because He lives in us and His healing power is available to us through His Holy Spirit. "There the Lord made for them a statute and rule, and there he tested them, saying 'If you will diligently listen to the voice of the Lord your God, and do that which is right in his eyes, and give ear to his commandments and keep all his statutes, I will put none of the diseases on you that I put on the Egyptians, for I am the Lord, your healer.'" "'I the Lord am healing thee.' This is the aspect of divine healing which the Apostle Paul so frequently emphasizes. It is not a mere fact or incident occurring occasionally in life, but it is a life of constant, habitual dependence upon Christ for the body; moment by moment abiding in Him for our physical, as well as spiritual need, and taking His resurrection life and strength for every breath and every step."